This is the final post in a long MBA Mondays series on projections, budgets, and forecasts. Today we will talk about what happens when reality starts to differ from what you’ve budgeted – you re-forecast. Forecasts are typically done mid-year but they can and should be done whenever the actual performance differs significantly from what was budgeted. Forecasts are not an attempt to throw out the budget. The company should continue to measure itself and report against the budget. The forecast should exist beside the budget and show what management thinks is likely to happen. Forecasts are important for a variety of reasons but first and foremost you want to know where your cash balances will actually be. And you’ll want to know where you will be on your revenue growth trajectory. If you are planning on doing a financing, forecasts are important because they will give you an indication of what the metrics investors will be using when they offer you terms for a financing. The process of doing a forecast is not very hard. You simply take the model you used for budgeting and put new numbers in for revenues and costs. The way most forecasts go down is the revenues are taken down to reflect slower sales growth. Then management looks at the costs in the budget. In some cases, costs are not adjusted because management feels that they need to continue to invest in the business. But in many cases, costs are adjusted down somewhat to reflect a desire to conserve cash. Either way, you’ll have a new set of numbers for the months ahead. You combine these new sets of numbers for the coming months with the actual results for the months that have already happened and you have your forecast. Once you do a forecast, it is a good idea to keep updating it as the year develops. If you do a forecast at mid-year and by the fall that forecast is off, do another forecast. The forecast is not another budget you have to try to meet. It is an attempt to estimate actual results. So keep adjusting the forecast in an attempt to nail it. As you get into the fall, you will start budgeting for the next year. 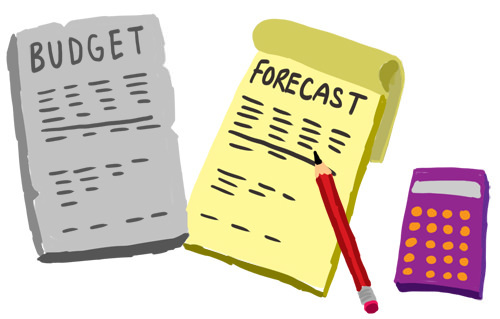 Use the learning that came from the forecasting exercise to make next year’s budget better. Think of budgets and forecasts as agile financial management. The budget is the annual release and the forecasts are the iterations based on feedback. So that’s it. We are now done with projections, budgeting, and forecasting. Next week we’ll tackle a new topic. Much about forecasting or revising your budget — same thing — is in the manner in which the model is originally created. If you document all of your assumptions on a separate worksheet for the original model and resist the temptation to just “plug in” a number from time to time, then as reality materializes you can just hit a button and the model will refresh itself. When you get really slick, you can make a pivot table from your accounting system directly to your budget model though I think there is a fair argument that getting a bit of paint on your hands adds context. I like to have budgets done long before year end on a bottom up basis (zero based, never incremental) and then tested by the actuals from the current year in which the budget is being crafted. I like a last minute CY or FY gut check before printing. Then I like to have the CFO update the forecast every month — remember it just requires changing the assumptions and we do this w/ a pivot table — and have a bottom up look at the end of each quarter for the balance of the year. When I look at financial performance I have prior year month/quarter, prior month/quarter, 12-month trends and forecasted month, quarter and year. I particularly like seeing information graphed as it makes the task more visual therby contemplating one’s natural analytical senses. This presents a fairly good picture of things and it provides a 360 degree view. The tough thing is getting it set up correctly. As your business matures and it becomes fairly predictable, it gets boring and is no longer the hassle that it originally seemed to be. While many decry the difficulty of forecasting startups, the truth of the matter is that only about 2 revenue accounts and 7 expense accounts fully describe the entire business in enough specificity and detail to make good numbers. While they may swing greatly, the focus on this few accounts is a good thing. It may actually get a lot more difficult in the future when much of the start up expediency decision making is absorbed into the business and is no longer in the rounding error. The entire process is an iterative process in which accuracy becomes significantly greater as you iterate and learn from doing. This article was originally written by Fred Wilson on June 7, 2010 here.